33 Travel Essentials that Make Your Long-Distance Flight Pleasant | 'Nuff Yet? Massive lists of cool gift ideas. This post may contain affiliate links. These links will allow us a small commission at no cost to you. Going to exotic places for rest and recreation will always be the best way to recharge ourselves, if only time and money will allow us to do so every month. Oh, and if only most of those exotic places aren’t located halfway around the world so you won’t have to endure that punishing 14-hour flight. Well, we can’t move those to-die-for spots closer to home, but we can certainly make your long-distance travel to get there more pleasant. All it takes is a well-thought-out plan that includes never getting on the plane without these travel essentials. When you’ve practically done everything you can and there’s still several hours to go before your plane reaches its destination, the best thing to do is get some shuteye. That’s easier said than done especially when you’re in Economy and stuck to a chair that barely reclines. So you have no choice but to sleep in an upright position, and you might have succeeded if not for the fact that your head lolls when you drift off and that shakes you awake. This, of course, won’t happen if you have the Trtl Pillow that supports and holds your neck in an ergonomic position when you fall asleep. Lightweight and super soft, it’s scientifically proven to give the best support for your neck, thanks to a patented internal support system that is within the soft fleece. As most people who have ridden on airplanes before, there is no such thing as total darkness in the vehicle for safety reasons. So if you’re one of those who simply cannot sleep even with just a sliver of light, this sleep mask should be a gift from heaven. Capable of blocking 100% of the light, the mask is also very comfortable even for those with sensitive skin as it’s made of natural cotton. It’s also got a fully adjustable headband so you can find the perfect fit for your head. What makes it stand out from the rest, though, is that it has eye cavities so you won’t feel pressure on your eyes even if you wear the mask tight. It even comes with a pair of soft foam earplugs and a carry pouch. Experts say you can lose up to 2 liters of water during a 10-hour flight because of the climate-controlled environment inside a plane that results in a relative humidity that can go as low as 10 to 15%. This can cause you to feel tired and irritable, taking away a big chunk of the excitement of your vacation. It’s therefore a must that you stay hydrated throughout the flight. But while there is available water in flight, it’s still a hassle asking from a crew. 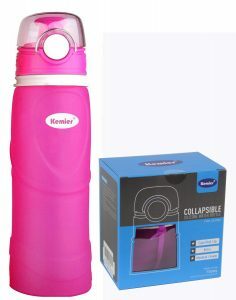 The solution is taking your own water with you using this collapsible silicone water bottle that you can fill up at the airport before boarding. Made of medical grade, BPA-free silica gel and non-toxic and odorless material, the 750-ml bottle can be folded up when it’s not in use, and has a leak-proof, wide mouth for easy cleaning or adding ice to the water. It can also be used for either hot or cold water as it can stand temperatures from -40°C to 100°C. A cup of hot, delicious coffee will always perk us up, whether it’s going through a long night at the office, or in an airplane in an even longer flight. If you’re about 30 thousand feet in the air, you can still enjoy a great cuppa if you’ve packed along these coffee cubes made from 100% Colombian coffee beans. Just pop a cube in a cup of boiled water, stir, and enjoy. You’ll always get the perfect sip. A family vacation with the kids is always the perfect bonding moment for everyone—once you’ve gotten to your destination, that is. But along the way, when you’re in the midst of a 14-hour flight, things can get testy, and you might start hearing a chorus of “Are we there yet?” until your head explodes. But don’t worry, you can keep them happy and occupied with the Fire 7 designed especially for them. The tablet has a 7-inch IPS display, 16 GB of internal memory expandable up to 256 GB with a microSD card, and 8 hours of mixed-use battery life. Just load it with enough games, movies, and music that your children love and they won’t feel the hours and the miles going by. 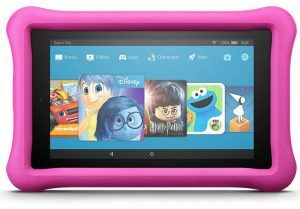 It also comes with a kid-proof case (available in different colors) that is tough even as it is lightweight and perfect for small hands. It’s true that most, if not all, airplanes nowadays feature a USB outlet on which to plug and recharge your gadget while you’re airborne. But it’s usually a single outlet and you most likely have more than one mobile device that will need some juice during the course of your long-haul flight. Fortunately, there are now a host of portable chargers in the market that can satisfy your needs. 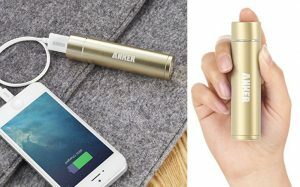 One of the best is this lipstick-sized power bank that can give additional juice to any gadget to last the entirety of the flight. And because it’s ultra-compact, it doesn’t take much space in your hand-carry luggage so you can bring as many as you and your travel companion need. You’ll certainly feel secure knowing your gadgets will not die on you at the most inopportune time. One of the things that frequent long-distance flyers hate is the feeling that their feet seem to have grown a tad too big for their shoes after spending several hours in flight. That is a natural phenomenon when blood is not efficiently circulated throughout the body that happens when you stay seated for too long. So, the best solution would be to make sure that you get some kind of activity every once in a while during a long-haul flight like walking around. It will also greatly help if you can actually remove your shoes. Of course, you can’t go barefoot in an airplane for sanitary reasons. 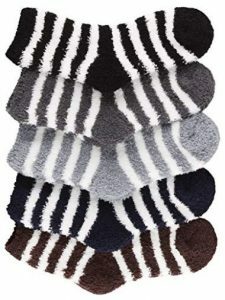 If you need to walk around, make sure you put on a pair of these comfortable and plush socks. They not only provide great insulation for your feet but are cozy to wear as the elastic bands at the ankle do not compress your feet even as they give you a good grip. Airplane travel may be the fastest way to get to that exotic place for a much-needed vacation, but it can also be exhausting if you are unable to get a shuteye all throughout the trip because of all the noise around you beginning with the incessant drone of the plane’s engine and completed by the cacophony coming from the other passengers. Even if you’re not trying to sleep, the constant noise can distract you from the task you’re trying to do to keep yourself entertained, be it watching a movie, doing a crossword puzzle, or writing in your journal. 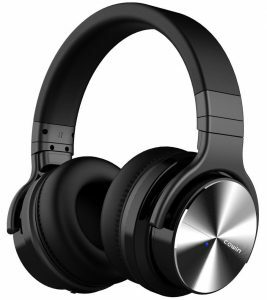 A great headphone, especially the Cowin E7 Pro, should fix that problem. Aside from reducing cabin noise to virtually nil, the headphone also provides crisp and powerful sound with a deep and accurate bass for all your favorite songs. It’s also lightweight and durable, and has soft ear cushions for a comfortable fit and make long listening sessions possible, which can last up to 30 hours in a single charge of its built-in battery. Just connect to your mobile gadget through Bluetooth and you’re off to a world of your own up in the sky. For a lot of us, going through the day without brushing our teeth at least a second time is something akin to not having a change fresh undies in a week. Now imagine having that experience for 14 hours. At some point, you’ll feel your mouth going unpleasantly dry and feeling hot that you just can’t wait to get your teeth brushed. The problem is, your toothbrush and tube of toothpaste were left in your check-in luggage. You can avoid this inconvenience with this set of disposable mini toothbrushes that, believe it or now, don’t even need toothpaste and water to work. 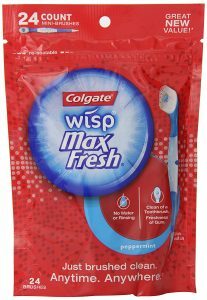 Each of the 24 pocket-sized toothbrushes has a built-in, sugar-free peppermint bead that easily dissolves to give off a minty freshness. Their handle also ends in a soft pick that you can use to remove hard-to-reach food particles before you brush your teeth. No need to rinse your mouth after so you can actually do the task right there at your seat if you find the lavatories always occupied and you’re craving to give your mouth the freshness it badly needs. When everyone’s settled and you still can’t get to sleep even after a couple of movies and a complete music album of relaxing songs, your mind might need some more calming down to do. 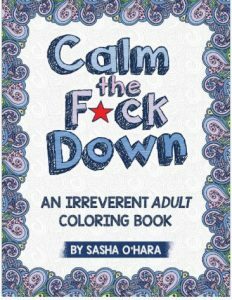 This fun adult coloring book might just do the trick. Definitely not for children, this paperback coloring book contains adult-only quips that will make you smile to go along with the coloring pages with details that go from moderate to complex. You’ll soon get yourself too absorbed in your coloring task that all the stress and worries of the day just slide through you, paving the way for some well-deserved shuteye. You did pack in your carryon the coloring materials you need, right? THESE ARE GREAT CHOICES TOO! Flying in Economy instead of Business or First Class will save you a lot of dollars that are best spent on your actual vacation, but the cramped space and seat can really be a pain in the neck, and virtually every part of your body. Children are particularly affected and will get cranky when they can’t get their desired position when trying to sleep. Adults will have the same issue, but will, of course, deal with it in a “mature” way, but keeping your legs down while in a sitting position for a long period of time can be hazardous to your health because of the lack of circulation. You would want to raise your legs after a while too. This is where the inflatable travel pillow comes in. 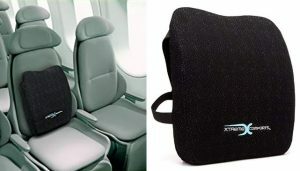 Made of high-quality PVC and easy to inflate, the travel pillow easily fits the tight spaces in Economy. 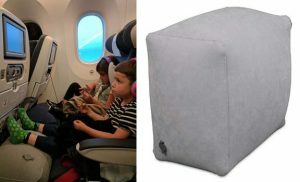 Its boxy inflated shape makes it an extension of the plane’s seat, giving the kids their own makeshift but comfortable bed. Adults can use the pillow as a leg rest. When deflated, it weighs a mere 8 ounce and comes with its own carrying bag. Finding the most comfortable spot for your feet after a few hours sitting in Economy—and you’re not even halfway to your destination!—is a struggle all too real for a lot of us who frequently or have gone on a long-distance flight. And we need to do it too for health reasons: to aid in our blood circulation to prevent swollen feet, or worse, blood clots in the leg. This sling footrest should therefore always included in your carryon. Best for people 5’10” or shorter, it allows you to rest your feet and prevents back pain and swelling of your legs. Just attach the strong straps to the tray table and rest your feet or ankles on the 11.5-inch wide base and you’ll feel like you’re riding in 1st class. It’s made of fleece and has reinforced stitching that guarantees its durability. We’ve all experienced it, the discomfort that we feel when our ear suddenly clogs or pops with the change of air pressure as our airplane ascends or descends. Children are more affected, and can cause them to panic, making their flying experience somehow traumatic. You can prevent this scenario by having them wear the Earplanes, a pair of hypoallergenic silicone earplugs, before both takeoff and touchdown. 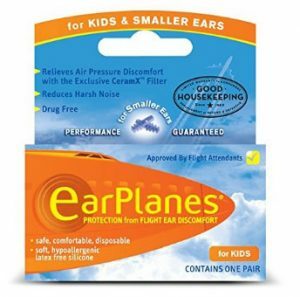 Best for children 1 to 10 years old and even for adults with small ears, the Earplanes are proven to relieve discomfort during the flight as it can regulate air pressure and even reduce up to 30 Decibels the surrounding noise, especially from the plane’s engine. Get additional comfort for your long-haul flight with this very lightweight 4-inch-thick pillow filled with soft foam and covered with brushed polyester that is soft to touch and won’t irritate the skin. It comes in several sizes from small to extra-large. 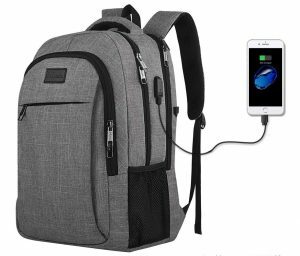 But what makes it perfect to bring along is that it can be compressed tightly that it can fit into most carry-on bag, and won’t easily unravel with its drawstring and cord lock. For the ultimate carry-on bag, nothing should beat this laptop backpack that’s more than meets the eye. 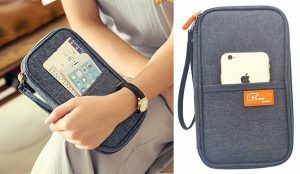 For one it’s built to last, as it’s made of water-resistant and tough polyester fabric and has metal zippers that won’t easily rust or fail. It’s also got a lot of storage spaces and pockets—a separate compartment for up to a 15.6-inch laptop and a roomy space for most of your in-flight necessities. The front compartment holds several pockets including those for pens, plus a key fob hook so you’ll have everything in order. There’s even a secret pocket at the back where you can put your most valuable things. A big plus is an external USB charging port that connects your portable charger that’s inside your bag to whatever mobile device you are using that needs extra juice. Even if you’ve got no back issues, sitting in a cramped space for several hours is not only uncomfortable but can even lead to pinched nerves and tight muscles. That is why for long-haul flights, we need to also have the proper back support to prevent future problems and help in blood circulation. Something that this lumbar pillow does so well. Made of 100% pure memory foam inside a removable and breathable cover made of bamboo, the pillow has an ergonomically designed contour for maximum back support and even pain relief. 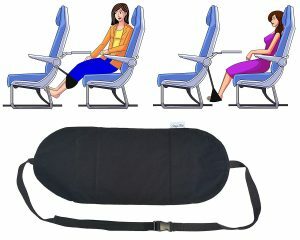 It also has dual 4-point elastic straps that are adjustable so it easily fits even airplane seats. You’ll be surprised how comfortable your long trip can be. One thing that frequent flyers have to contend for with co-passengers during flights is armrest space. It may be a minor thing for your arm to have a place to rest on and be comfortable, but that concern becomes more serious when you’re on a long-distance flight. Fortunately, there is an ingenious solution to this, and it’s called the Soarigami. 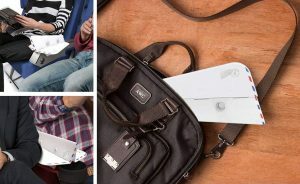 Inspired by the Japanese art of paper folding, the Soarigami portable armrest extender and divider simply clamps onto the airplane’s armrest and provides you and your neighbor respective spaces on which to rest your arms without getting in contact with each other because of the built-in divider. It’s made of recyclable plastic and high-quality leatherette and folds flat when not in use so it will fit into most carry-on bags. 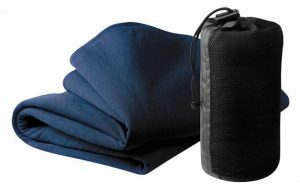 Airplane temperature can feel chilly, and while blankets are provided to passengers, you will always have a better and more comfortable alternative like this Cool Max blanket that’s super compact and light that it won’t bulk up your carry-on bag but has a warm knit that breathes well and effectively wicks away moisture, giving you the most comfortable feeling way up in the air. The blanket measures 55” x 70” and is made of 100% polyester. With the very low humidity of airplane air, our skin quickly loses its moisture. To compensate, it produces more oil, and everyone knows how awful the feeling is of an oily face. That fact is even made worse with long-distance travel when you have to endure several long hours of dry air. That, of course, can be fixed with a great facial mist. You are actually allowed to bring one in your carry-on bag as long it does not exceed 100ml. So there’s no excuse not to have one for the sake of your skin. 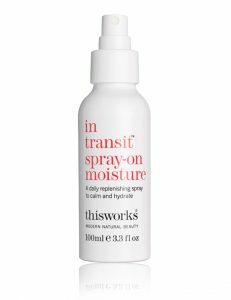 The In Transit skin hydrator should be a good choice, providing instant relief for your dehydrated skin. It’s a combination of plant oils, sea minerals, and organic aloe vera water aimed that soothes skin of any type, including sensitive ones. Experts agree that 4 hours or more of inactivity (read: staying seated) during a 14-hour flight poses some serious health risks to people, especially blood clots that may develop in the legs but move to eventually end up in the lungs. Then there are the “minor” issues too like swelling and cramps. If you’ve got other conditions in the first place like tendonitis, varicose veins, and even diabetes, that raises the risks some more. So better make sure you’re prepared to take on that long-haul flight by wearing a pair of these amazing compression socks that slips on like silk and puts different levels of pressure at specific parts of the legs for maximum effectivity. 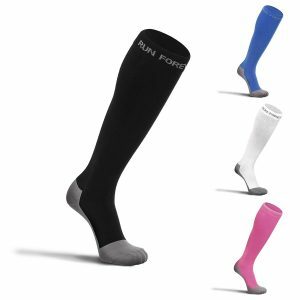 Not only do these socks promote blood flow, they are also stylish enough to fit any type of wardrobe. If there’s one thing that will make a trip pleasant, even how long it may be, is food—glorious food! Of course, we can’t rely on just in-flight meals to satisfy our cravings, so it’s always better to bring what you want and pack them in you carry-on. If you’re not exactly sure what you want, you can’t be wrong with the wonderful snack bars that are included in this snack box. It’s filled with 56 healthy bars and nuts that kids and adults alike will munch with gusto anytime they go hungry during the long-haul flight. 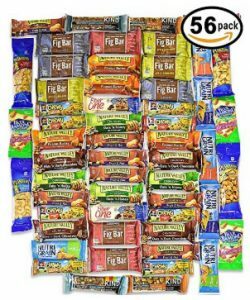 There are chewy and crunchy granola bars and fig bars in different delicious flavors as well as ready-to-eat almonds, cashews, and sated and honey-roasted peanuts. 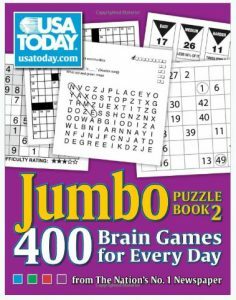 Definitely, they’re a great (and healthy) way to pass the time and tide you over until the next full meal. When you’ve ran out of things to do (including some refreshing sleep), you might want to spend another chunk of your long-distance flight writing whatever comes to mind. It’s not only productive on your part, but also puts you in a different state of relaxation and calmness. 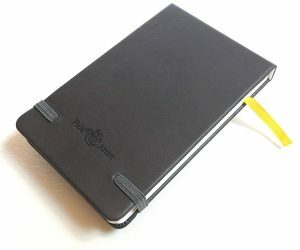 It can be the start of diary, or just a journal about your day-to-day life, or it can even be simple doodles and artworks of things you see around you. 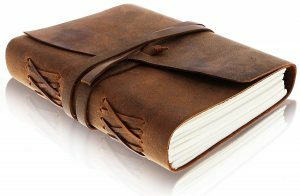 Make your writing even more inspired and easier by using this leather-bound journal that is as functional as it is beautiful. Handy at the size of 7 x 5 inches, it has genuine water buffalo leather cover that’s naturally tanned with a special oil, keeping safe inside the 120 pages of blank, off-white paper that’s just thick enough to prevent bleed through even if you use a pen. Completing the rustic, antique look is the hand-stitched flap and stitched Coptic leather binding that keeps the journal securely closed when not in use. 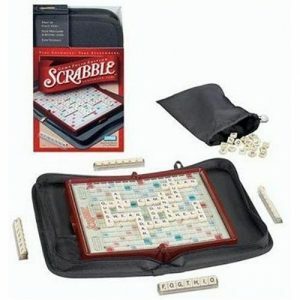 One way to combat boredom when you’re cooped up inside a plane with your destination several hours away is to play board games, just like this awesome Scrabble folio edition. It’s perfect for traveling as it comes with snap-in tile racks and letter tiles, which means the pieces won’t move. The game tray also folds when it’s time to pack up, and everything fits nicely inside a zippered nylon case. 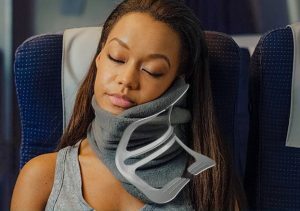 It’s a neck pillow with a hoodie, which means you not only get neck support while trying to fall asleep upright in your Economy seat but you also get a nice eye shield and level of privacy that a hoodie provides. Inside the hooded travel neck pillow is a highly comfortable memory foam that adjusts to the owner’s shape. It’s covered by 100% fleece material for additional comfort. Adjustable drawstrings in the hood make sure the fit is always right and help you block out your surroundings so you can sleep better as your plane eats the miles to your destination. Of course, your long-haul trip doesn’t start only when your plane finally takes off. It has actually started when you first set foot in the airport and had to clear customs so you can finally board your plane. You can make that part of your trip pleasant as well by making sure everything you need to present to authorities easily accessible such as your passport and boarding pass. 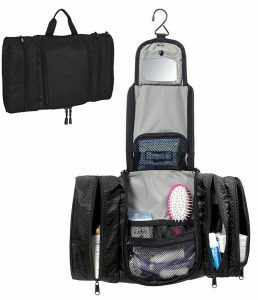 What better way to do that than to organize things with this document organizer that fits your passport perfectly as well as a slew of other items you should not leave without, such as your credit cards, tickets, cash, and cell phone as well. Made of high-density linen/cotton-blended fabric, the passport holder measures 9 x 1.2 x 5.2 inches and comes with a detachable strap for easy handling. It’s also waterproof, lightweight, and durable. A great way to pass the time when you have buckets of it like on an airplane taking you halfway around the world is to lose yourself in a compelling book. You might even find yourself wishing there’s still an extra hour or two so you can finish what you’re reading and get to the satisfying ending, especially if it’s a novel. If you’re a geek by heart and think that the ‘80s is the most wonderful decade of all, you should definitely have in your Kindle Earnest Kline’s novel that was nominated as one of America’s best-loved novels by PBS’s The Great American Read. It’s also been recently turned into a movie by no less than 80s icon himself, Steven Spielberg. 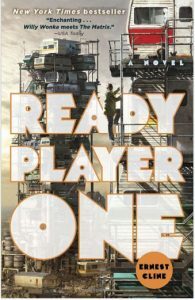 Ready Player One will take you forward to the year 2045 that is so bad people would rather live in a virtual utopia called the Oasis. Its creator and richest man on the planet, James Halliday, passed away but not before hiding three keys inside the Oasis and declaring that whoever finds them will inherit his fortune and have control of the Oasis. He also left behind clues and puzzles based on his love for everything 80s, and it’s up to our hero, Wade Watts, to decipher them after devoting much of his life obsessing with Halliday. He will need to contend though, with some pretty powerful people who would do anything, including murder, to get their hands on those keys. Believe it or not, you can find moments of creativity even in the most unlikely of places, like if you’re in the midst of a 14-hour flight with nothing else to do. When this comes, make sure you’re prepared to unleash your artistic side for some boredom-busting burst of creativity. Whip out this pocket-sized plastic watercolor box and your art journal and paint the hours away. 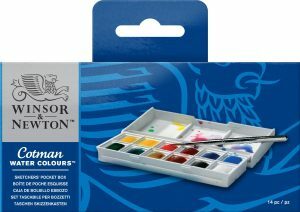 The box features an integral mixing palette in the lid and comes with one pocket brush and 12 Cotman watercolor half pans of varied hues so you can produce colorful artworks to your heart’s content. And speaking of art journal on which to sketch with your watercolor box, this should be a perfect fit your taste and needs. Bigger than the usual watercolor journal at a size of 4 x 6.5 inches, it nevertheless still fits in your pocket so it’s very portable and will be of use not just inside the plane but when you’re actually checking out your exotic destination. It consists of 80 inside pages made of 140.-lbs., 200 gsm paper that is 100% recycled and acid-free. Its high-quality hardbound cover is made of soft-to-the-touch thermos-PU leather highlighted with a classy embossed logo. Paint away the hours! Passing away the time on a 14-hour flight can be a fun experience when you have this hand-held gaming console that not only brings lots of exciting challenges but a sense of nostalgia too. 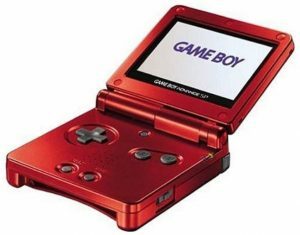 The Game Boy Advance SP (the initials stand for “special”) was first released in 2003, yet 15 years later, it is still a source of enjoyment for kids and adults alike. The geek in you will appreciate the fact that this “boy” can play all Game Boy cartridges and has the distinct advantage of having a built-in rechargeable lithium-ion battery, unlike its older siblings that used commercial batteries. So make sure you pack your Mario and Legend of Zelda game cartridges plus a host of others for some serious retro gaming session up in the sky. One way to keep yourself feeling fresh and comfy despite spending several hours seated cooped up in a long-haul flight is to make sure you’re still well-groomed and your teeth and mouth taken care of. With safety regulations, however, you can only bring small amounts of toiletry with you in your handcarry. This is where the flat toiletry kit comes in handy. It’s only 2.25 inches thick but there’s a lot of things you need that can be packed into its four compartments like your personal razor and floss. One compartment is lined with clear material where you can put things that might leak or be damp. It’s even got a hanging hook and a removable mirror. As its name suggests, this amazing gadget is for passengers who have gotten window seats in the airplane. And what it does is make your long-distance trip a tad more pleasant as it gives you an extra space to put in your stuff that can’t be accommodated anymore by the plane’s food tray table. It easily slides and fits into the window shade track and you’ve got more space for drinks and snacks. The spAIRTray has a non-slip pad so your drink or gadgets remain in place. It also folds flat and comes with a cloth travel bag so it stores easily in your carry-on. What if we told you…that you can mix up two great-tasting cocktails during your long-haul flight? Yes, not a fantasy but reality, thanks to this cocktail kit that’s designed to pair with the in-flight single-served spirits. Packed inside a crisp metal tin are all the tools you will need two delicious cocktails to make your long flight a lot more interesting. They include a recipe card, margarita syrup, spoon/muddler, riming salt, ½ oz jigger, coaster, and linen. Oh, you must be 21 or older to enjoy this sky-high treat.